This spring, I’ve final­ly got­ten my act togeth­er enough to give near­ly back-to-back recitals at CSU Stanis­laus and Sacra­men­to State. 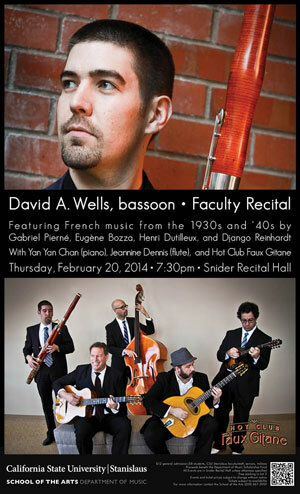 The two pro­grams are very sim­i­lar, and fea­ture French music from the 1930s and ‘40s. I’ll be play­ing two pieces for bas­soon and piano, both con­cours pieces from the Paris Con­ser­va­toire: Gabriel Pierné’s Prélude de Con­cert sur un thème de Pur­cell, Op.53 and Hen­ri Dutilleux’s Sara­bande et Cortège. At CSU Stanis­laus, these will be accom­pa­nied by Eugène Bozza’s Sonatine for flute and bas­soon. At Sac State, they’ll be paired with two reed trios: Jacques Ibert’s Cinq pièces en trio and Dar­ius Milhaud’s Pas­torale. I’m espe­cial­ly excit­ed that the sec­ond half of each con­cert will fea­ture my swing quin­tet, Hot Club Faux Gitane (with Bil­ly Gay and Eric John­son on gui­tars, Gary Williams-Guichard on man­dolin, Jake Myers on bass, and me on bas­soon). This group (seen in the posters below), is loose­ly mod­eled on Djan­go Rein­hardt’s Quin­tette du Hot Club de France, which was active in Paris in the 1930s and ‘40s. I’ve been play­ing with the group for almost three years now. We play a mix­ture of the clas­sic gyspy swing reper­toire, oth­er jazz stan­dards, tunes from the post-Djan­go gyp­sy tra­di­tion, and orig­i­nals. This will be the group’s sec­ond appear­ance at CSU Stanis­laus, but the Sac State con­cert will be our Sacra­men­to debut. Details and posters for the two con­certs are below. Posters for CSU Stanis­laus (left) and Sacra­men­to State (right). Click for larg­er ver­sions. Many thanks to Kristi­na Stam­per at the CSU Stanis­laus School of the Arts for cre­at­ing this won­der­ful poster for my upcom­ing recital. 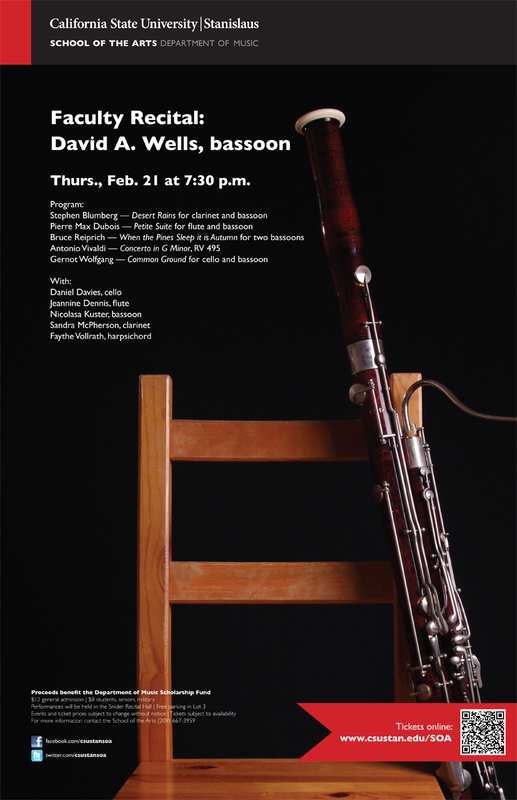 You can watch the con­cert live (Feb. 21, 7:30pm Pacif­ic) on the web right here. Down­load the full con­cert pro­gram. Two weeks from today, I’ll be giv­ing my first fac­ul­ty recital at Cal­i­for­nia State Uni­ver­si­ty, Stanis­laus. I joined the fac­ul­ty there last fall, and this will be my first offi­cial per­for­mance at the school. Two of my col­leagues there, Jean­nine Den­nis and Daniel Davies, will per­form with me, along with friends/colleagues from Sacra­men­to State and Uni­ver­si­ty of the Pacif­ic. The pro­gram is a bit of an odd one. There’s not a par­tic­u­lar theme — it’s sim­ply a col­lec­tion of pieces I want­ed to play and peo­ple with whom I want­ed to col­lab­o­rate. Four of the pieces are 20th or 21st cen­tu­ry duos, three of which are by liv­ing com­posers. This pre­pon­der­ance of new­ness is off­set a bit by one of my favorite Vival­di con­cer­ti. Today begins an excit­ing semes­ter full of bas­soon events at Sacra­men­to State. Most events are free, and all are open to the pub­lic. We’ve got stu­dent per­for­mances, guest artists, a mas­ter­class or two, and I’m play­ing both a baroque con­cer­to and two pro­grams of new and recent music. See the Music Depart­ment Cal­en­dar for park­ing and tick­et infor­ma­tion and oth­er details. Junior Performace/Music Edu­ca­tion major Tay­lor Haug­land will per­form works by Camille Saint-Saëns, Carl Maria von Weber, Jean Daniel Braun, and Carl Nielsen. Brett Van Gans­beke holds the Doc­tor of Music degree from Indi­ana University’s Jacobs School of Music, where he stud­ied with one of the world’s pre­em­i­nent Baroque bas­soon­ists, Michael McCraw. Dr. Van Gans­beke will per­form a short recital of works by Baroque com­posers, and then work with Sac State bas­soon­ists in a mas­ter­class for­mat. Guests Scott Pool (Assis­tant Pro­fes­sor of Bas­soon, Uni­ver­si­ty of Texas at Arling­ton) and Stephen Caplan (Pro­fes­sor of Oboe, Uni­ver­si­ty of Neva­da Las Vegas) are joined by pianist Nat­su­ki Fuku­sawa and sopra­no Robin Fish­er in a recital of works by Rach­mani­nov, Sun­ny Knable, Jen­ni Bran­don, Miguel del Aguila, and oth­ers. This low-down duo will per­form numer­ous short works as part of an evening of music, dance, the­ater, pho­tog­ra­phy, design, art, film, and poet­ry at the Crock­er Art Muse­um. Ohne Name per­forms 20th and 21st cen­tu­ry reper­toire writ­ten or adapt­ed for two bas­soons. 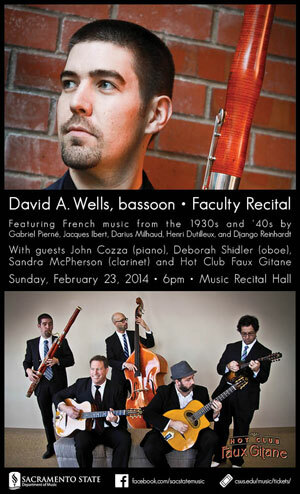 This con­cert will include works by Igor Stravin­sky, Sofia Gubaiduli­na, Marc Mel­lits, and William Davis. Fea­tur­ing indi­vid­ual per­for­mances by the mem­bers of the bas­soon stu­dio plus the antics of the Sac State Bas­soon Quar­tet. Anto­nio Vival­di wrote a stag­ger­ing 39 con­cer­tos for bas­soon, of which 37 exist in com­plete form. The Con­cer­to in G minor (RV 495) is one of the most intense of these, and dis­plays the composer’s mas­ter­ful grasp of both the tech­ni­cal vir­tu­os­i­ty and emo­tion­al depth attain­able on the bas­soon. Oth­er works TBA. 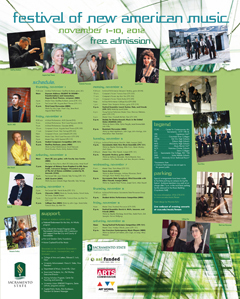 On Fri­day, Novem­ber 9, I’ll be giv­ing a recital as part of Sacra­men­to State’s 35th annu­al Fes­ti­val of New Amer­i­can Music. The fes­ti­val itself runs from Novem­ber 1 until Novem­ber 10 and includes numer­ous con­certs, mas­ter class­es, composer’s forums, and per­for­mances in local schools. Augus­ta Read Thomas is this year’s keynote speak­er, and oth­er guests include Third Coast Per­cus­sion, City­wa­ter, Cal­liope Duo, JACK Quar­tet, Travis Brass, Allen Viz­zu­ti, and Root­stock Per­cus­sion. And amaz­ing­ly, all the events are free and open to the pub­lic. 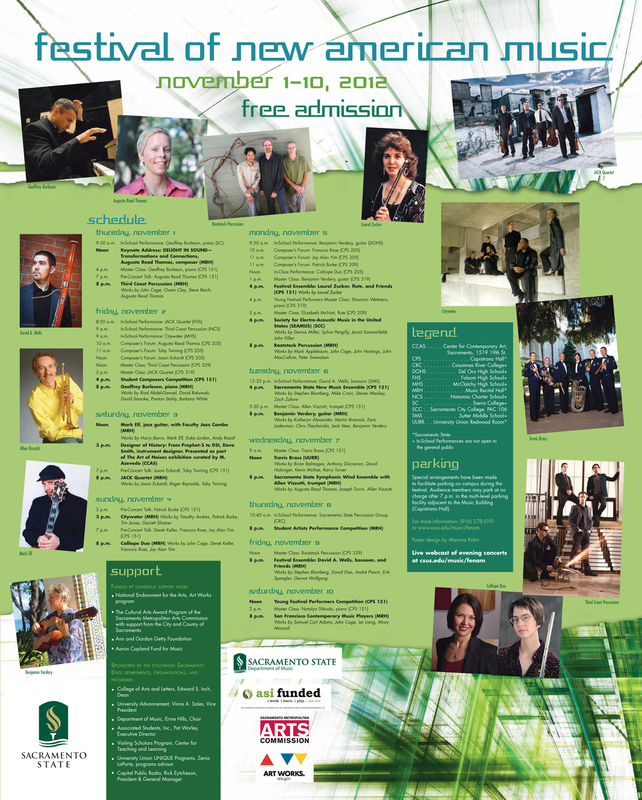 See the poster at right for the full sched­ule. The idea for this con­cert came to me last year. While plan­ning for my April recital, I real­ized that I had a whole stack of recent music by Amer­i­can com­posers that I want­ed to per­form. So, I set much of that aside for this fall. In its now final form my pro­gram con­sists of five pieces, which I think do a good job of demon­strat­ing the wide vari­ety of music that has recent­ly been writ­ten for bas­soon. Four of the five pieces were writ­ten in the last five years; the “old stan­dard” of the pro­gram is André Previn’s Sonata, pub­lished way back in 1999. I’m excit­ed to be play­ing works by three com­posers who I know per­son­al­ly, and to be giv­ing the pre­miere of a work by one of them, my Sac State col­league Stephen Blum­berg. My recital (and many of the oth­er FeNAM con­certs) will be broad­cast live via the school’s Livestream Chan­nel.